Goal: Identify new cover crops that will protect and build soil, as well as provide a cash crop, to replace peas in the county. Three potential cover crops will be evaluated: winter pea, fava bean, and buckwheat. 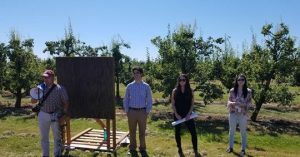 On September 19th of 2017, the WSU research team initiated a randomized complete block experiment at the WSU NWREC Mount Vernon Experiment Station. This experiment has four replicates of four treatments and each treatment is 14 × 50 ft. 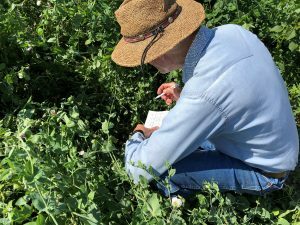 The four treatments within each block consist of a fallow control, winter pea (Pisum sativum L.), fava bean (Vicia faba L.), and buckwheat (Fagopyrum esculentum). 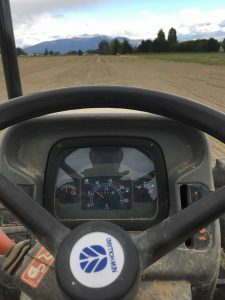 These cover crops were selected because they have the potential to be left in the ground during the spring to provide a harvestable crop and economic return to the grower in the summer. Using current retail prices for winter pea $2/lb, fava bean $1.70/lb and buckwheat $2.90/lb growers have the potential to make a profit selling cover crop seed and furthering their bottom line should they enter the food market, especially organic and value added. 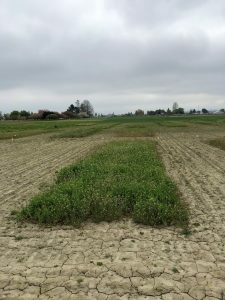 Unfortunately, Western Washington suffered from a late winter frost that destroyed the Buckwheat planting and migrating waterfowl consumed all of the Winter Pea except for the plot closest to the road (figure 3). After discussing this ordeal with several WSU researchers these plots were replanted at 100 pounds to the acre on April 13th. Soil samples from 0 to 12” deep were collected in the fall and again in the summer. 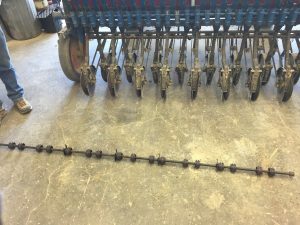 A blended fertilizer application of Muriate of Potash, Boron, Procote, and Urea was applied on May 9th in accordance with soil samples that were collected on the station. 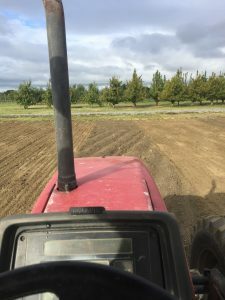 In a second study, potatoes were planted on May 18th on a previous WSU NWREC trial that contained green peas and fava bean cover crop and a 14 x 50 ft area that had been fall planted with Buckwheat, although the Buckwheat did freeze out at approximately 3 inches in height in late winter. The potatoes were topped and desiccated on August 9th. Four sub-samples from each plot will be harvested in approximately one month after desiccation. Size and yield will be measured. This data will be shared with potato growers at the Western Washington Potato Workshop on Feb 22nd at WSU NWREC in Mount Vernon, WA. An application of Sethoxydim herbicide was applied to the trial on June 1st. Soil Density and water infiltration measurements were made on July 25th (Figure 4). 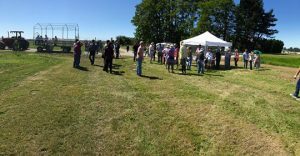 All of this information was shared at the WSU NWREC Field Day to approximately 60 agricultural stakeholders on July 12th (figure 5a and 5b). Biomass and harvest of the Cover Crop are expected to begin August 22nd and Potato Harvest is expected to begin September 21st. The Skagit Conservation District would like approval of 2nd year funding prior to sending their staff to collect this data.